April | 2012 | Small Farmers. Big Change. Before I came to Equal Exchange, I spent most of my working life in the produce departments of consumer cooperatives. I hefted 50-pound cases of potatoes and cabbages, cleaned delicate bunches of cilantro and spinach, and built mountains of broccoli and apples that customers quickly reduced to foothills. Seward Co-op, where I spent eight years, was a particularly good place to work, with a membership (including me) that highly valued a sustainable local economy. Our member-owners wanted to know who grew their food, not just be assured that it was organic. Local farmers brought their produce to our back door, and stayed to chat about the weather, the progress of the season, their CSA or farmers’ market successes and failures, the challenges of transportation and distribution, and so on. Some of them aired age-old feuds, but most of them respected each other, and certainly most of them knew each other. Organic farmers have had to do their own crop research, develop their own cost analyses, figure out their own marketing strategies – it stands to reason that they share skills and knowledge, and have thereby built a community. 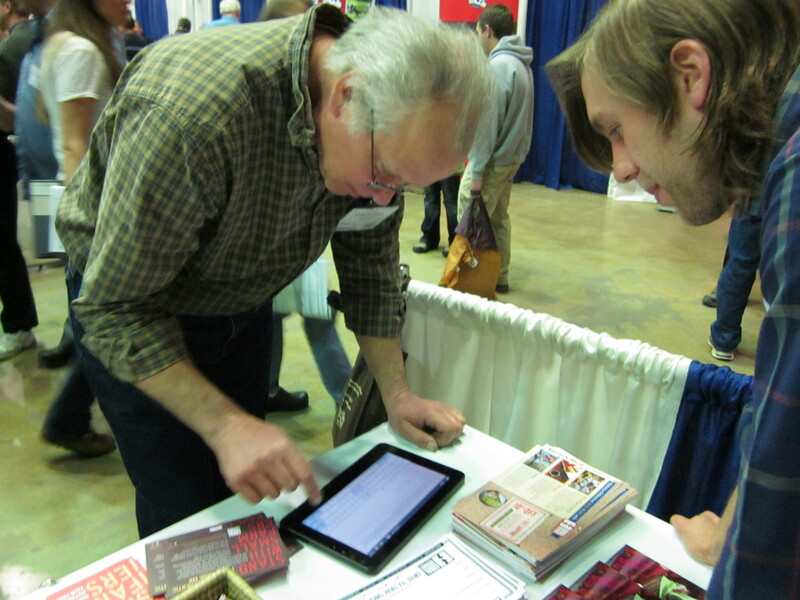 Seward Co-op sent me several times to the Organic Farming Conference in La Crosse, WI, sponsored by MOSES (Midwest Organic & Sustainable Education Service. There I had the privilege of watching farmers not only teach and learn from each other, but get down on the dance floor. Oh, and this conference is the only one I’ve ever been to that had good food – it’s all organic, donated by and bought from mainly local producers and distributors. When I started at Equal Exchange, I learned that most tea, including fair trade tea, comes from plantations. And plantations (or estates, as they’re often called) are not simply “big farms.” Tea plantations in India often include bonded labor – families working the same jobs for generations, with no ownership or control over their work, dependent on the benevolence of wealthy owners or transnational corporations. Remembering the bountiful snack and hot-beverage tables at MOSES, I decided I wanted our tea, perhaps the only small-farmer tea on the US market, to be on those tables. I wanted the farmers I knew and admired to be able to delight their tastebuds or feed their addictions (whichever it is) with a product grown and harvested by people like them – small businesspeople who own their little piece of the world, make their living from it, and feed the rest of us. 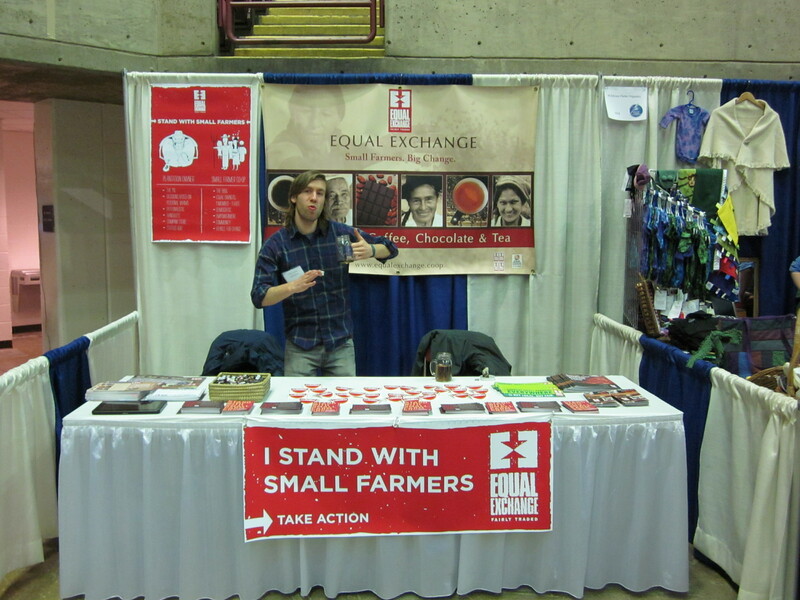 It was the last weekend of February and Equal Exchange co-owner Luke Fowler and I were fired up about the progress of our campaign for authentic fair trade. We wanted to make the connection between family farmers here and family farmers in the rest of the world. And we did. And it was awesome! At other events (not farmer-focused ones), it’s been difficult at times to convey the authentic fair trade message. I think many people who want to make ethical choices in their lives, but don’t have time to research, don’t even realize that fair trade is for and by land-owning small farmers organized into democratically controlled cooperatives. Well-meaning consumers assume that fair trade costs more because it means higher “wages” paid to workers, as opposed to better “prices” paid for farmers’ crops. This assumption makes perfect sense if you think about the way most people work in the US. We have jobs, or else are trying to find jobs. We rent our bodies, minds, and time to our employers. Our lack of any ownership stake in our jobs tends to make us forget that some people do own their jobs, and not only their jobs but the land on which their livelihoods depend. The farmers we talked to at the conference seemed to understand right away the difference between small farmer cooperatives in fair trade and large-scale plantations. Many responded with parallels they saw in the organic movement – especially how large-scale corporate agriculture has sought to weaken organic standards time after time. Years ago, Riverbend Farm owner Greg Reynolds told me that for the previous couple years, he’d earned a wage effectively lower than his employees (whom he tries to pay as livable a wage as he can afford). But, he emphasized, unlike his employees, he owns the farm. Ownership matters. Farmers know this. Worker-owners know this. Food co-op members know this – they often put it on their bumper stickers. And I think it’s safe to say that people like Greg don’t just own their farms – they own the organic movement. Companies like Monsanto, which have actively prosecuted farmers for common agricultural practices like saving seed, have no right to say or even influence what’s organic and what isn’t. Which is why I think we ought to be listening to small farmer cooperatives and their representatives when they say that plantations can’t be part of fair trade. If you support your local organic farmer, why would you buy plantation coffee?